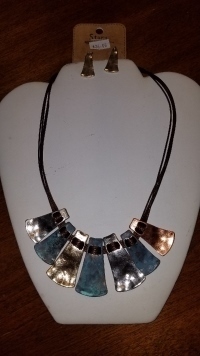 Fashionable patina necklace set. 18 inches long with 3 inch extension. 7 pieces drop from a brown cord in alternating colors of silver, blue, gold, and copper. Silver matching earrings. A sure piece to highlight any wardrobe.